For all you New York heads RSVP by clicking here for a free concert presented by Olde English. This party goes down tonight as you, the guest, help in crowning the illest tattoo artist. You know they'll be servin up that goodness as your favorite malt liquor will be generously spread to all who are in attendance. 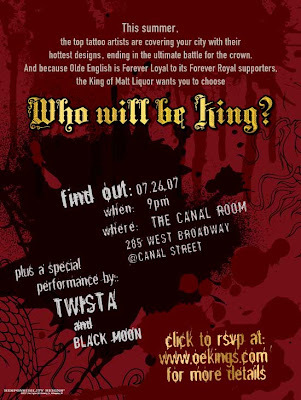 Drank to the performances of Scarface, Black Moon & Twista at The Canal Room. On the decks will be DJ Evil Dee (Black Moon) & DJ Kelly D (BET). Judges for this evening are Uncle Ralph McDaniels, Sean Price & Dave Jeff. Hosting duties have been bestowed upon Sway of MTV.